I thought it might be nice to impart some of my wisdom, and talk about how I go about photographing my products without professional gear, lights or a light box. This will be especially good for those of you who have new online shops, and perhaps aren't quite there in the photo stage. Trust me, I we've all been there. But as you might know it by now, great photos help you sell better on marketplace websites such as Big Cartel or Etsy. Ideally you would like to set up your artwork either outside on an overcast day, or inside in a room with large windows and soft, natural light, out of direct sunlight. If you are photographing inside an using window light, make sure all other lights in the room are turned off. Place your camera on a stable, horizontal flat surface. This can be a tripod, or in my case a small bag of basmati rice* on top of some boxes. Make sure it's far enough away from your art so you can zoom in with your lens and fill your camera's screen / viewfinder. You don't want to be too close with your lens zoomed all the way out, or you'll get wide-angle lens distortion. If you don't have a zoom lens, simply place your camera at a distance where your art fills most of your camera's screen. (*What's great about the rice bag is that if I need to angle my camera, the rice will hold my camera at the angle, without having to hang on to it, in case I need to let go to hold both my product for sizing). Make sure the lens is parallel and centered with your product. If your work is at an angle, make sure you match that angle with your camera or you'll get perspective distortion, and your work won't appear straight, or the size will be large on top and small on the bottom (or vice versa). If you don't have a fancy camera, don't worry! Neither do I! Just make sure you can set your camera to the aperture priority, or Av. I set the ISO (film speed) to auto. This will ensure a smooth image without no noise/grain and accurate colours. By the way, you can also take nifty pictures using your iPhone, iPad or Android. Just make sure you download the Snapseed app (which is like Photoshop) to colour correct any photos later on. Set the white-balance in your camera that corresponds to the type of light you are using. If you're using daylight choose either daylight, cloudy or sunny (depending on your camera's settings). In my case I used cloudy for the photos in this blog. If your camera has a flash, turn it off. It'll create harsh reflections and they won't mix well with the light you're using. Go to the dollar store and buy yourself a few pieces of white cardstock. I use these both as backdrop, and to redirect the light back to my product to illuminate the side not facing the window. This lessens the shadows, and brightens up the image significantly. Using a self-timer for this is key. Turn on your camera's self-timer. Using this will allow a hands-free shot that will be perfectly still and not blurry. Focus on your work, get the proper exposure, and then start taking pictures. Take a few photos to be safe and then look at them on the screen to make sure you have what you need. Zoom in on the pictures to see if they're sharp or blurry. If they're blurry, make sure your camera is properly focused on your product. If you're in zoom, make sure it's not fully zoomed as lenses are never at their sharpest with fully zoomed in or out. Lastly, use that self-timer on your camera to avoid any camera shake that might result from pushing the shutter button. If your photos are too dark or light, you can adjust this in-camera by using exposure compensation. It's always best to get the correct exposure in-camera than fixing it on the computer as making adjustments in Photoshop can degrade image quality. What my photo looks like when I view it in Photoshop. Time to do a little adjustment. Once you're done taking photos, connect your camera or memory card to your computer and open them using your program of choice (Photoshop, Preview, iPhoto). Zoom into your artwork at 100% and double check that all your images are sharp and correctly colour balanced. You want your work to look as close as possible to how it does in real life. This is important for online marketplaces. Customers don't want to be surprised when buying an item. If you're happy with your work, crop your image so the extra space is removed, and your artwork is visible. 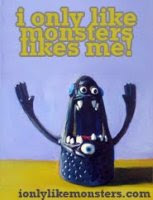 After some adjustments, the background is noticeably brighter without ruining the monster itself. Save a copy at full resolution!! You never know when someone might want a high resolution copy for their website/blog or magazine. I've often missed this step, and was stuck with low res images. If you're using Photoshop, keep the .psd file for this. Once you're all finished, you can then upload them to your website! 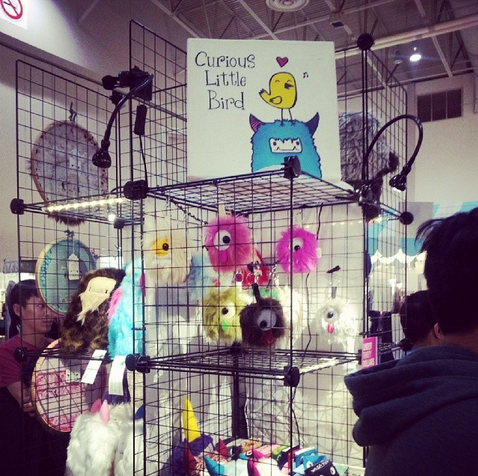 2014 One Of A Kind Spring Show wrap up and overview. Hello!! How's everyone today? I've been back from Toronto for a few days now, decompressing, relaxing, taking some time off. Working at the One Of A Kind show really does take a lot of work, and recovery takes time. But all in all the show was awesome!! I met so many nice people, and got some great exposure! If you haven't been following me on Facebook or Instagram, here are some photos from the week. I didn't have a chance to get any photos of the kiddie models walking down the runway with a few Curious Little Bird monsters. A shame! My 3 month marathon monster making definitely paid off. 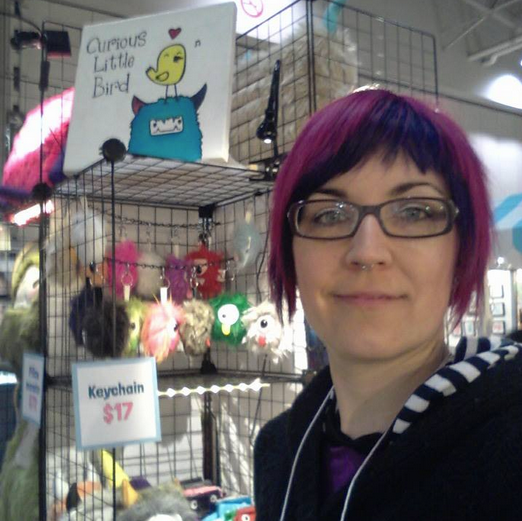 I also want to thank everyone who came to visit, and those who drove for hours just to say hi! You made my day! 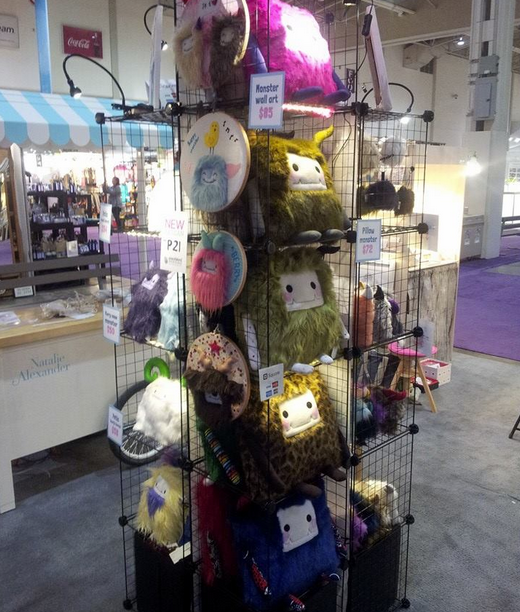 The monster pillows were a hit. By Sunday I had sold my very last one. I will have at least 3 times the amount for the Christmas show. 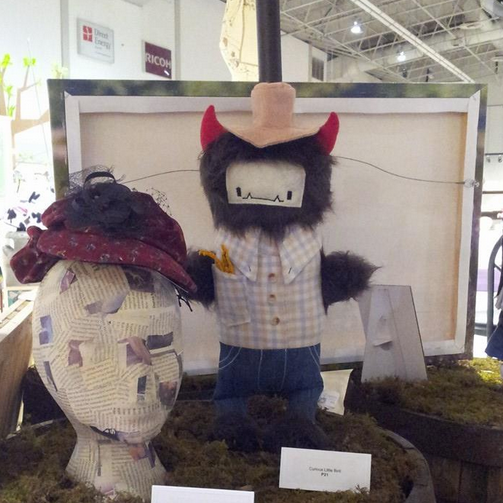 The publicist for OOAK wanted a few of my monsters for the Canada AM morning spot. They decided to choose the green & rainbow pillow monster. 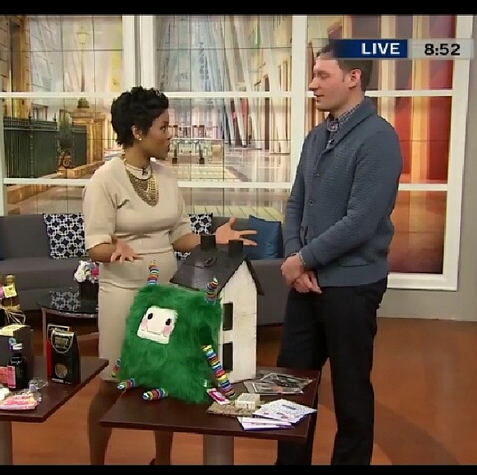 Look at how cute he looks on TV!! If you happened to catch it, he was the star of the show. :) You can watch the spot here! 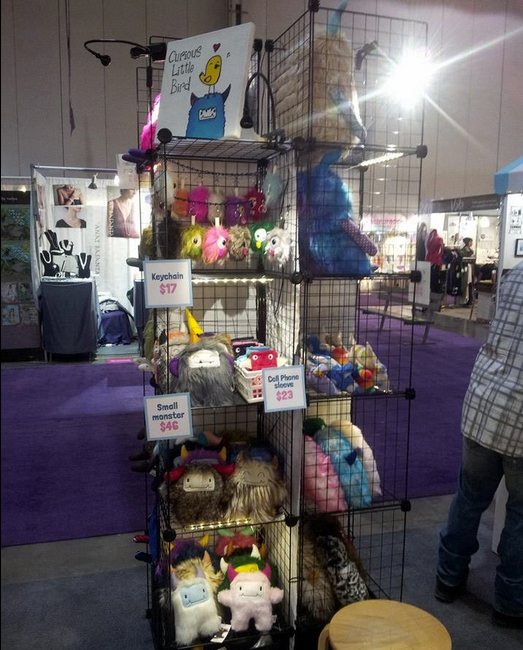 My booth was looking pretty empty by Sunday. Those pillow guys were all gone, and I had to fill all the cubes with the smaller guys. 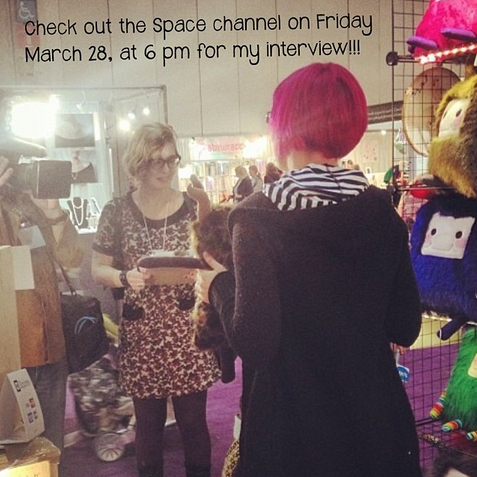 On Wednesday I also got interviewed for InnerSpace on the Space Channel, but sadly they didn't use it. I did get a 1 second shot of a yeti at the very end. You can watch that episode here. The girls at the beginning of the show, Jaimie and Jessica, make awesome dolls and little felt guys. Their business is called Magic Circus. 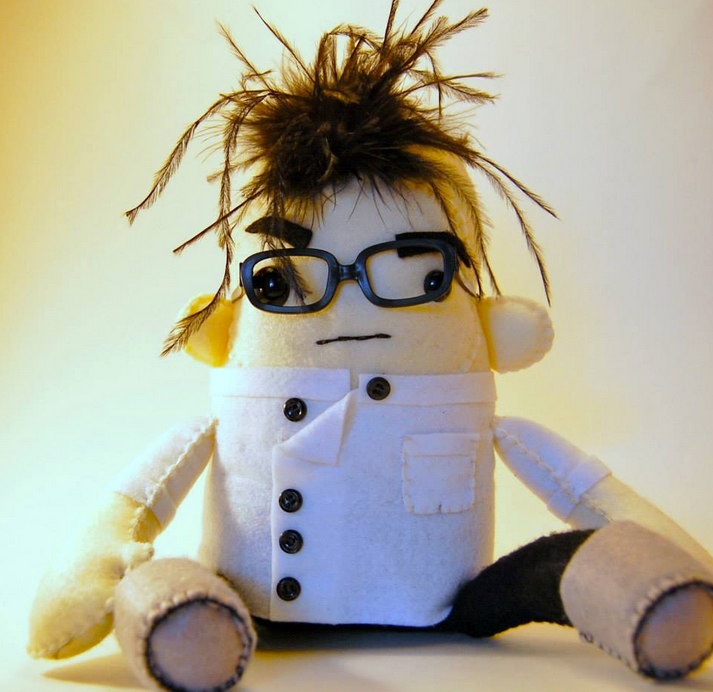 Below is a felt Mad Scientist from Jessica Craddock. I fell in love with him right away. I just love his feather boa hair!! And the details are awesome. 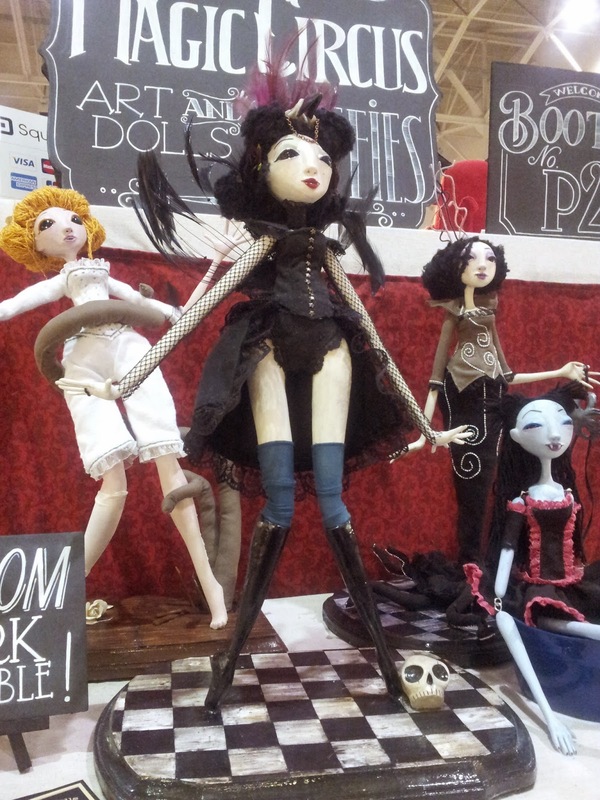 These lovely ladies are made by Jaimie Craddock, and are poseable, and all made with air drying clay? They're extremely awesome!! I'll keep you updated with new things as they happen later on. For how I'm enjoying my brief time off from work. Monday is back to the grind. I've been asked multiple times from customers if I'm going to be at OOAK for Christmas, and I've told them all I've applied, but won't hear back until June. So starting Monday I must work to build up my inventory as if I am already accepted. Hopefully I'll have new things to show you in the next few weeks/months. 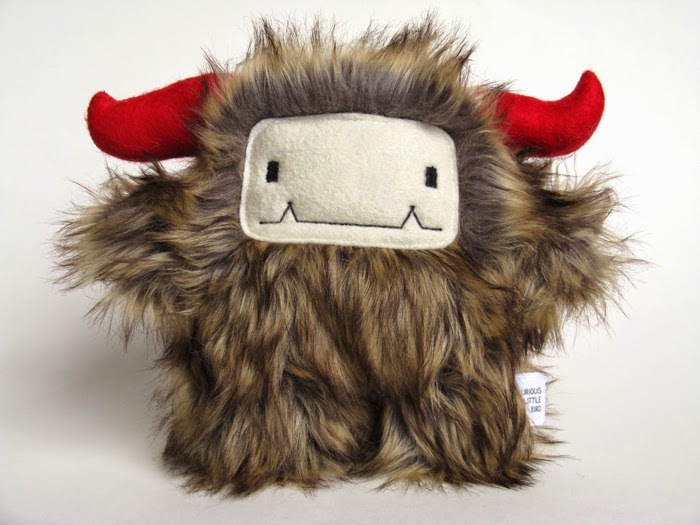 Let's just say I had a detailed talk with a customer about a monster pillow backpack.... One side is furry and fun, and the other is leather-like (or vinyl) and very discreet. I may make a few!! I have some vinyl hiding around here somewhere. :) Stay tuned!! Here's to a great start to 2014!